In 1983, astronaut and astrophysicist Sally Ride became the first American woman in space, and still remains the youngest American astronaut to travel to space, when she took her place aboard the space shuttle Challenger. 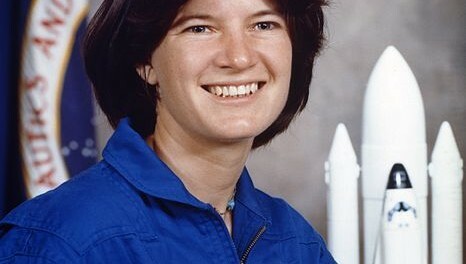 Sally Ride grew up in Los Angeles and went to Stanford University, where she was a double major in physics and English. She received degrees in both subjects and went on to gain a master’s degree and a Ph.D. in Physics. She joined NASA in 1978 when she was selected from thousands of people who answered an advertisement seeking applicants for the space program. Sally served as the ground-based capsule communicator (CapCom) for the second and third space shuttle flights and helped develop the space shuttle’s robot arm. Being quizzed by the press before the Challenger flight, Sally was forced to answer questions such as “will the flight affect your reproductive organs?” and “do you weep when things go wrong on the job?” In total, Sally spent a total of more than 343 hours in space and was training for her third flight when the space shuttle Challenger disaster occurred. After the accident, Ride served on the presidential commission that investigated the space shuttle explosion. After leaving NASA Sally started her own company, Sally Ride Science, to create educational programs. She also wrote, or co-wrote with Tam O’Shaughnessy, seven books on space aimed at children, with the goal of encouraging children, particularly girls, to study science. Sally was married, briefly, to fellow NASA astronaut Steve Hawley, but after her death, her obituary revealed that her partner was Tam. Sally and Tam were childhood friends, they met when both were aspiring tennis players. Sally was the first known LGBT astronaut.